The Special Education Department at Franklin Academy serves a wide variety of educational needs. Our programs include several Resource Rooms and RISP (Regents Intensive Support Program) classrooms. Most of the students in these programs are in mainstreamed classes. Another level of service that many Special Education teachers at this level provide is that of a Consultant Teacher where they help students within their mainstreamed classes. Often, a lot of time is spent reinforcing the concepts taught in the regular education classroom. Many of these students also attend half day Occupational Programs at North Franklin Educational Center. Most of these students really enjoy the “hands on” approach offered in these Vocational programs (Building Trades, Electrical Trades, Cosmetology, Culinary Arts, Child Care and Health Care); these programs often become the favorite part of their day. Some of our students will not receive a local or Regents diploma and attend our 12:1+1 and 8:1+1 classes. These students usually have more intensive educational needs and they gain basic life and job skills and receive more intensive instruction in math, reading and written language. Our department also offers services in Occupational and Physical Therapy, as well as Speech, Hearing and Vision services. 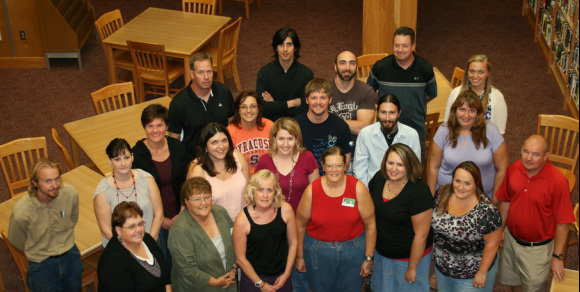 We are a group of dedicated teachers, therapists, psychologists and paraprofessionals who continually strive to implement best practices in the service of our students as they approach the transition to the adult world.